It's rare that I find myself on this side of the fence... having someone do commission work for me as opposed to me doing it for someone else. It's actually been a nice change of pace. After writing the series of articles on commission work, I thought I'd compare my experience with the points outlined in my posts to see how it matches up with what I've been advocating that everyone else watch out for and do. 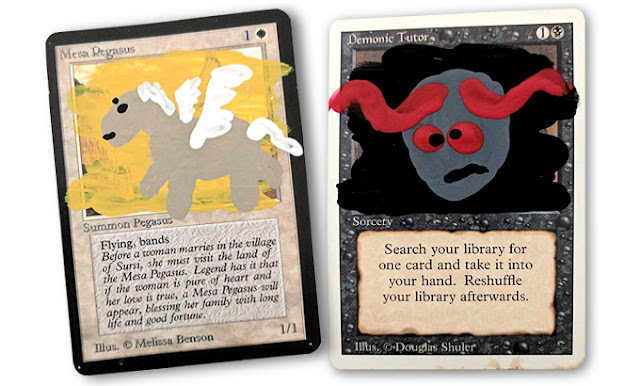 In this case, I commissioned Terrible Alters to do an alter for me. He actually ended up doing two for me in the end. When hiring someone, there are four things you need to know or have in mind (project scope, your budget, deadline and some flexibility) before starting the process. No problems there for me. I knew what I wanted to have done, had my budget, no real deadline to meet and understood the process when it came to being flexible. I'm not gonna lie... I was excited to be having this work done as a client instead of doing it as an artist. 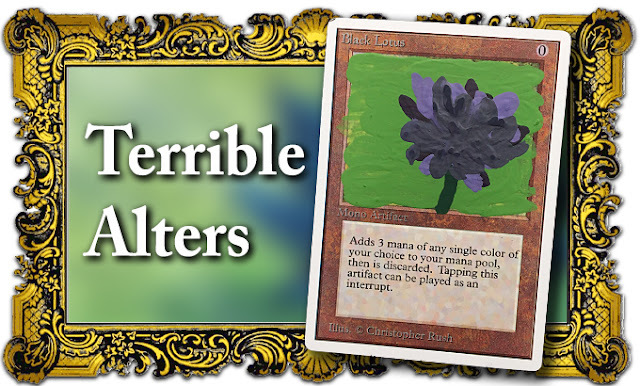 How did I find Terrible Alters? Through Instagram. I use social media to keep up with what others are doing in the games I love and for inspiration/blogging ideas. After seeing his work, I became a follower right away. His work, by his own admission, will leave you disappointed. Beauty is in the eye of the beholder as they say and there's a quality to his work that I really enjoy. He's right, it's truly terrible, but he's doing what he loves to do and it shows in his work. That's what caught my attention and it's what I wanted in my alter. Why him and not someone else? For a long time I've been wanting to get this particular alter done and I've looked at a few different artists over time as possibilities. Trouble was, I could never find anyone I felt could do it justice. Not in the way that I imagined it. I suppose that's the problem with being an artist yourself, you know what you want the finished product to look like and it can be tough to find someone else who can meet those expectations. I wanted to get a Black Lotus altered for my deck. It's such an iconic card. I've seen lots of great alters out there, but I wanted to go the other direction. I wanted to have artwork that was the complete opposite of what was on the card. Instead of a professionally done piece, I wanted the "five year old with finger paint and no adult supervision" look. I couldn't do it myself. That just wasn't going to work. It's not about skill here, it's that I'm too attached to the project. I needed someone who wasn't as attached to do the alter for me. As soon as I saw his work on Instagram, I knew he was the one I was going to contact for this project. My original post on finding a good artist lists off a number of "red flags" to be aware of when hiring someone and I am happy to report that not a single one ever came up in any of my interaction with Terrible Alters. Some additional examples of his work I think are amazing. How did I do as a Client? No too bad. I managed to avoid causing almost all the major problems artists despise. I did ask that horrible opening question, "How much for an alter?" but in my defense, there was no information on Instagram (which is understandable as they limit what you can put in your bio) or any other website for me to go to for pricing and such. The only other problem I created was asking for a slight change after seeing the alter. This was more of a mutually agreed upon change than it was me demanding something be changed after that fact. Credit should go to Terrible Alters for working with me when it came to making the change and he was more than accommodating to make sure the finished card was exactly what I wanted. Thinking about it, this may be the very first time I've ever had someone else do work for me. I'm glad I did it. It's been a great ride from start to finish. Working with Terrible Alters has been a dream. He was prompt in his communication,always willing to explain what he was doing and super helpful with anything that came up. When I originally contacted him for the project, I had a couple of very specific project requirements I wanted to make sure were met. Little things, but important to me in how I wanted the final piece to appear. He went out of his way to make sure he knew and understood exactly what I was looking for. This kind of thing goes a long way in helping clients (including me!) stay calm and not worry about their project. The second alter ended up being this Time Walk. To be honest, I like this one even more than the Lotus. Just like the Lotus, he had complete freedom to interpret the image however he wanted and this one hits it out of the park for me. I love this card. If you like what he does and you're considering getting an alter done by him , do it! If nothing else, find him on Instagram @terrible_alters and follow him. And for those who made it this far in the article, you can rest easy. It was not a real Black Lotus or Time Walk that were altered. They were both proxies that were set aside specifically for this project. Terrible Alters did a great job with both cards. 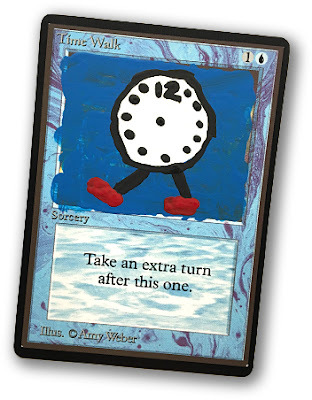 Image credit: Card alters by Terrible Alters.